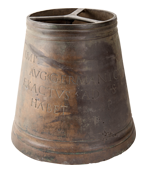 The Clayton Collection is an internationally important collection of Roman artefacts derived largely from Hadrian’s Wall. The collection contains over twenty thousand items, the vast majority of which are archaeological finds, though it also includes 53 books, 1,282 archival records, 11 paintings, six historical photographs and 12 cases and cupboards. John Clayton had an extensive library, containing many archaeological books, some of which remain in the care of the Trustees. Much of the archival material held in the Collection relates to its own 20th century history. Coins represent the largest part of the archaeological collection, numbering 11,655, (9,344 of which come from the famous Coventina’s Well deposit). Pottery is the next largest group, with over 5,000 records (many of them documenting multiple sherds). The Collection has always been known for the number and significance of inscribed and sculpted stones (which includes 97 altars, 39 statues and 56 centurial stones). The rest of the material includes items of jewellery, tools, glassware, military equipment and votive offerings. 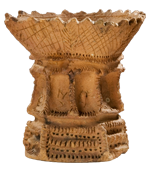 Overall, the Clayton Collection contains an important, renowned and wide range of Roman material culture, from a large geographical area of the Roman frontier in Britain. John was born on 10th June 1792 and died on 14th July 1890 aged 98. He was the 4th of 11 children (the 3rd son) of Nathaniel and Dorothy Clayton (née Atkinson). Through inheritance and shrewd investment, John became an extremely wealthy man. When he died his heir inherited £728,746 (equivalent today to c. £43.6 million), as well as land totalling c.26,708 acres. Clayton became articled as a clerk in his father’s firm in 1809, qualifying as a solicitor in 1814. Joining the family firm he worked alongside his father before taking over one of the largest legal practices in the North of England alongside his two brothers Matthew and Michael. He became Under Sheriff in 1816, before taking over from his father as Town Clerk of Newcastle in 1822. Having jointly inherited the Chesters estate from his father in 1832, Clayton wasted little time in beginning to investigate the site he now owned. 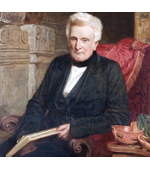 From the early 1840s, when he first began to excavate at Chesters, Clayton conducted an excavation somewhere along Hadrian’s Wall nearly every year until his death. These excavations were led first by William Nickol, who was succeeded in 1840 by William Tailford Senior (c.1806-55), and after his death by his son, William Tailford Junior (1831-1912). Clayton used local farm labourers to carry out the work, merely visiting the sites when he could fit it around his work, often on a Monday, which was the day he set aside for archaeological researches. As well as excavating, Clayton had an active interest in preserving Hadrian’s Wall for future generations. In his memorial it was said “Whenever an estate came into the market having on it some portion of the Wall, he strove to become its possessor”. In 1834 John purchased the stretch of the Wall from Knag Burn to Steel Rigg. By the time he died in 1890 he owned almost all the Wall from Acomb to Cawfields, five forts and almost 20 miles of Hadrian’s Wall. Clayton was the first person to understand that the whole landscape of Hadrian’s Wall, was as important as individual sites or finds, and that the Wall as a monument should be preserved in situ. In buying such large tracts of land along Hadrian’s Wall Clayton had the opportunity to exploit the natural resources on this land, in particular the thousands of pre-cut stones. Luckily for Hadrian’s Wall, this was not his plan; he wanted to improve the condition of the Wall and protect it. To this end he demolished and re-built farmhouses away from the Roman remains, for example at Housesteads in 1860, Peel Cottage in the 1860s and Shield-on-the-Wall between 1867 and 1886 (Woodside and Crow 1999, 86- 87). Steel Rigg Farm, was deserted by 1867 and not replaced when it was demolished in 1898 (Woodside and Crow 1999, 87). As well as this work he also paid for and oversaw restoration work on the Wall itself between 1848 and 1873 at Peel Crags, Hotbank Crags and Housesteads Crags (Woodside and Crow 1999, 103). Modern analysis of this work has shown that it “allows the surviving core to ‘breathe’, thus preserving it” (Woodside and Crow 1999, 104). Clayton was never a collector in the traditional sense; he did not seek to amass a full run of coins of all Roman emperors or possess an example of all types of brooch, and he was not creating a cabinet of curiosities. Nor did he collect because it was fashionable; he was genuinely interested in what the finds could tell him about the Romans. He kept what was found on his land and excavations, and occasionally acquired items from the local area to avoid them being dispersed, such as the Walbottle Hoard. He was also given various items from his antiquarian colleagues, such as two pieces of Samian pottery from the Isle of Harty in Kent, or picked them up on his travels, like tesserae from Pompeii. In his article on the Thorngrafton arm purse, Clayton indicates an early understanding of the importance of provenance of material. He argued that the coins were “valuable only from their association with the Roman Wall” (Clayton 1859, 271). Items which he purchased, or were gifted, have been clearly marked in the Collection, perhaps indicating Clayton’s understanding of the need to know where items had come from, at least to a site level. After John Clayton’s death in 1890 the Collection began a new stage in its life. 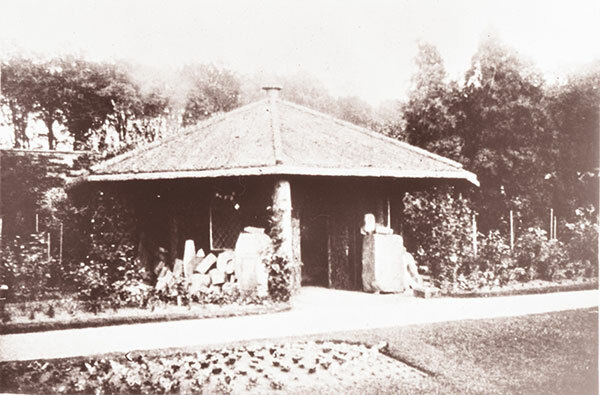 Clayton’s will, written in 1886, asked his executors to catalogue within a calendar month “the pictures and framed prints and the statues marbles Bronzes Shells Mineral Specimens and other Articles of virtue and all the Altars Vases Sculptures and all and every the Roman remains which shall be in or about or belonging to my Mansion house of Chesters or the gardens or pleasure grounds”. Nathaniel George Clayton (1833-1895), John’s nephew and heir contracted the local architect F.W. Rich to build the current museum. On 6th August 1890 (less than a month after John Clayton’s death), Nathaniel wrote to Robert Blair saying, “I am going to see Mr Rich’s plan of the Museum tomorrow”. In the same letter, Nathaniel indicates that Blair was working on a catalogue, so it seems some attempt was being made to adhere to the will. Nathaniel’s son, John Bertram, who inherited the estate at his father’s death in 1895, oversaw the next stage of the museum preparation. William Tailford Junior, Clayton’s foreman of excavations and local antiquary J.P. Gibson moved the artefacts from the house to the museum. The museum was open to the public by March 1896 and the Collections archive contains visitor books from the earliest visitors. Between 1895 and 1900, H.R. Hall (an Egyptologist from the British Museum) was asked by John Bertram to create a hand-list for visitors to the museum. Hall’s methodology appears to have been to simply list each item in the cases as they had been laid out, marking them with his catalogue number. His catalogue contains little text or explanation and is very different from a modern catalogue. When John Bertram died in 1900, his mother, Isabel (Mrs Nathaniel) Clayton inherited the estate. In the summer of 1900 Isabel asked E.A. Wallis Budge to carry out “numbering, mounting, labelling and exhibition of the antiquities”, as well as to create a new catalogue (Budge 1903, vi). Budge was actually Hall’s superior at the British Museum, and so no better qualified than Hall to identify and catalogue Roman material. As well as a catalogue of the collection on display, Budge arranged mounts for the large stones, and re-arranged the order of the items in the table-cases. Enormous credit must be given to Isabel Clayton for her care of the estate, museum and Collection for 28 years. She continued to pay for the upkeep of the museum, keeping it open to visitors as well as maintaining the archaeological remains of the large Wall estate. Isabel employed F.G. Simpson to be “a sort of archaeological land-agent with instructions to keep in repair the camps and so much of the Wall as are on the Clayton estate” (Crow 2004, 134). Simpson continued the conservation work that Clayton had started and helped to protect some of the most famous sections of the Wall. 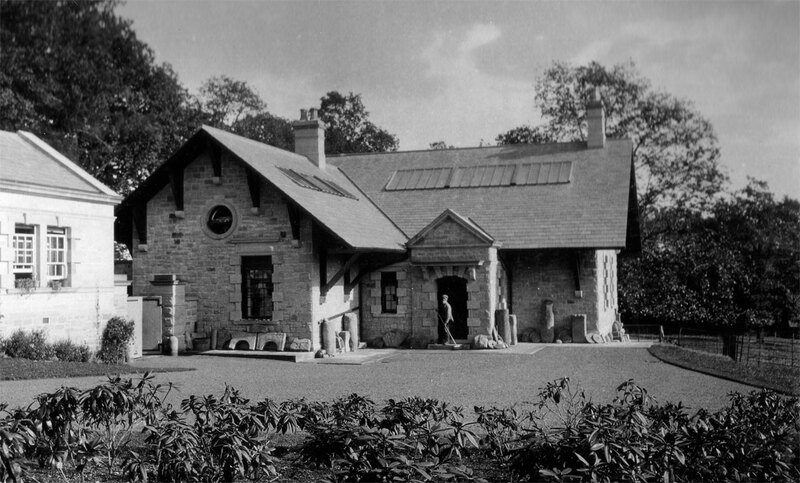 By 1901, Tailford had moved to the Lodge at Chesters, the small gatehouse next to the museum built at the same time. The gatehouse contained the mechanism to open the gate and so Tailford had a dual role as gatekeeper and museum caretaker. By 1911 two of his daughters, Sarah (1867-1941) and Margaret (1871-1955) were living with him. Tailford died in October 1912, ending almost 60 years of working with, and caring for, the archaeology on the Clayton estate. When Isabel Clayton died in April 1928, the new heir John Maurice Clayton (her great-nephew) decided to sell the Hadrian’s Wall estate to cover his gambling debts. The estate was to be split back into the individual farms and sold off at auction. This included the Chesters estate, with the mansion house, museum and gate house. There was also to be a sale of the contents of the mansion house, as well as the contents of the museum, constituting a major risk to the Collection for the first time in its history. When local archaeologists and other interested parties discovered this, they pressured John Maurice into keeping the Collection together, preferably in the museum. 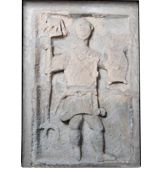 R. C. Bosanquet (the excavator of Housesteads in 1898) played a key role in this effort. This group persuaded John Maurice to sign a Deed of Trust in which “the Settlor has handed over to the Trustees the collection of Roman Antiquities”. The collection was deemed to be those items displayed at the time in the museum. Captain A.M. Keith, who bought the Chesters estate, in the land auction of 19-20th June 1929, became a Trustee. The deed was signed on 21st November 1930 and the original Trustees were Captain Keith (the owner of the land and museum), George MacDonald (numismatist and archaeologist), B. M. Holland Martin (unknown), R. G. Collingwood (archaeologist), William Parker Brewis (archaeologist) and R. C. Bosanquet (archaeologist). Captain Keith took on the upkeep of the museum building, and paid for a caretaker. Rosemary Douglas-Menzies, a daughter of Captain Keith remembers that Sarah and Margaret (Maggie), the daughters of Tailford were paid to open the gate to the driveway, take money from visitors to the museum and clean (pers. comm.). The Ministry of Works took Guardianship of Cilurnum Fort in June 1953. The site then came under the Department of Environment (which absorbed the Ministry of Works in 1970), who retained responsibility until 1983 when the site came under the care of English Heritage. The finds were still owned and cared for by the Trustees, but entrance to both site and museum was managed by the various official bodies. The creation of the post of Curator of Hadrian’s Wall Museums by English Heritage in 1983 meant that both the site and its finds were the responsibility of English Heritage. This was the first time that there had been a permanent, salaried curator for the Clayton Collection and so was an extremely important step forward. The post was filled by John Dore (1983-1986), Sally Dumner and Bill Hubbard (both short-term), before Georgina Plowright took up the position in 1987, retiring in 2012. Ms. Plowright left in 2012, when Frances McIntosh took over the post.